This snarling, canine beast pads forward on all fours, its slender front limbs looking more like hands than a wolf’s paws. Once per month, a barghest can devour a nonevil humanoid’s corpse as a full-round action to gain a growth point. It gains a bonus equal to its growth point total on attack rolls, CMB rolls, saving throws, and skill checks. Its maximum hit points increase by 5 for each growth point it gains. For every 2 growth points, a barghest’s caster level for its spell-like abilities and its CR increase by +1. When a barghest reaches 4 growth points, it sheds its skin and becomes a greater barghest, losing all of its growth points (and bonuses) but gaining the stats presented on the page for a greater barghest. Said to be fiendish relations of all goblinoid races, the hateful barghests come to the Material Plane to feed. As they consume the bodies of innocents, they grow increasingly powerful. 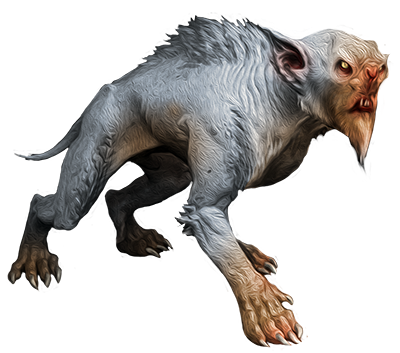 A barghest eventually sheds its skin to transform into a greater barghest, at which point it often seeks out a tribe of goblins or other creatures to rule.